As a BSc Television and Broadcasting undergraduate at the University of Portsmouth, I am indulged by CCI TV which is the university TV channel. 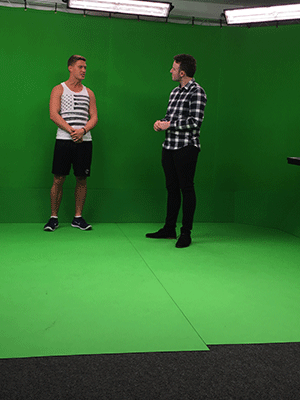 The course is unique within the industry as third years are required to broadcast weekly half hour magazine programmes on the channel. At least three presenters are required every week for the live TV programme and these are put forward by the talent manager of CCI. In my first two years at university, I was always known to audition and present. I was given many presenting opportunities and essentially taught myself by simply watching back and acknowledging what I can improve. Personally, I am lucky as I come from an acting background therefore presenting came relatively naturally to me. Now being in my final year, and quite content with my presenting abilities, I thought I would put myself forward as the talent manager for CCI TV. This was also an opportunity for me to work with new presenters that are looking to develop their skillset. It was my turn to find out what it was exactly that made a presenter stand out amongst the rest. I knew that this would be insightful towards my own career when looking for representation by a talent agent once I graduate. My initial point of action was to organise auditions within the whole creative faculty so that I could attract potential presenters from all subject backgrounds. It is crucial to understand that some presenters can be a specialist in a certain subject area which is why I wanted to make the auditions open. Presenting can vary in style, and so can the shows that are being broadcasted on CCI TV therefore it was key to have as much variety as possible. It was definitely difficult trying to communicate with a number of big personalities and organising what time works for who so I kept this as simple as I could. Each presenter was given a 15 minute time slot to come into the TV studios and meet me. My goal was to take the auditions at a different angle than the previous years, and essentially make them more cut-throat similar to the real world. I believe it is important that at this academic level, we are portrayed the difficulty of the media industry, simply to push ourselves to become a better version of what we want to do. I knew that I had to communicate this carefully because I didnt want to seem like I was being unfair on any of the presenters that were less natural in front of a camera. On the audition day, there were three clear categories I divided my presenters into. These categories were those who are natural in front of a camera, those who can present but may require practise and those who simply just arent cut for the job role. It was interesting to notice the small things that a presenter can do that doesnt work in front of the camera. Likewise, sometimes a presenter can have all the training in the world but may not be naturally blessed with the right amount of charisma and authenticity. I guess this is where different talent managers incorporate and voice their different opinions. My viewpoint as a new talent manager is constructed of the thought that the energy of a presenter should be their selling point. A prime example of this is my favoured presenter Maya Jama, a recent host for ITVs Cannonball. Her presenting style works for me because it is classic which works with several genres of television but also a real representation of her character allowing audiences to connect directly with her soul. This is evident through the diverse nature of programmes she has presented from 4Music and also her own documentary When Dad Kills: Murderer in the Family. Interviews can be an element that lets presenters down. It was interesting to see the amount of presenters that let their nerves get the better of them when I put my assistant beside them to act as a guest. I gave the presenter a topic and asked for them to start a conversation based on this. On live television, presenters can often be put on the spot in spontaneous situations that they dont necessarily expect. A good presenter should be able to tackle this. Now, having completed a successful first set of auditions, I have realised that managing talent is rewarding. Having the ability to recognise a great presenter and distributing them for different shows pushes me to enhance my own presenting career. I embody the features of great presenters, as well as keeping my own unique attributes. Not only has this journey motivated me to explore the role of talent manager further, it has also resulted into a signed contract with a talent management company last week... I didnt have to wait for an agent until graduation after all!